27 Apr A BREW-TIFUL BEFORE AND AFTER REVEAL: The Five Kings Restaurant & Picaroons Brewhouse + A SHARE TO WIN CONTEST! The Five Kings Restaurant & Picaroons Brewhouse is located in one of St. Stephen’s oldest buildings, the train station. The vision for Picaroons and The Five Kings Restaurant was to provide a beautiful and unique dining atmosphere in the heart of St Stephen. Picaroons began in 1995 as a production of Northampton Brewing Company in Fredericton. The company has since grown and established multiple microbreweries in New Brunswick; their craft beer can be found in pubs and liquor stores all across Canada. Head Chef Lisa Aronson and her business partner Sean Dunbar, owner/operator of Picaroons, contacted us to discuss designing their latest project. We met them on site the former Canadian Pacific Railway Station, the spot that would soon house these two businesses. What is unique about this location is that the station was recognised back in 2006 as a local historic site by the Canadian Register of Historic Places. The station was built back in 1929 and features terrific late 19th to early 20th-century architecture. 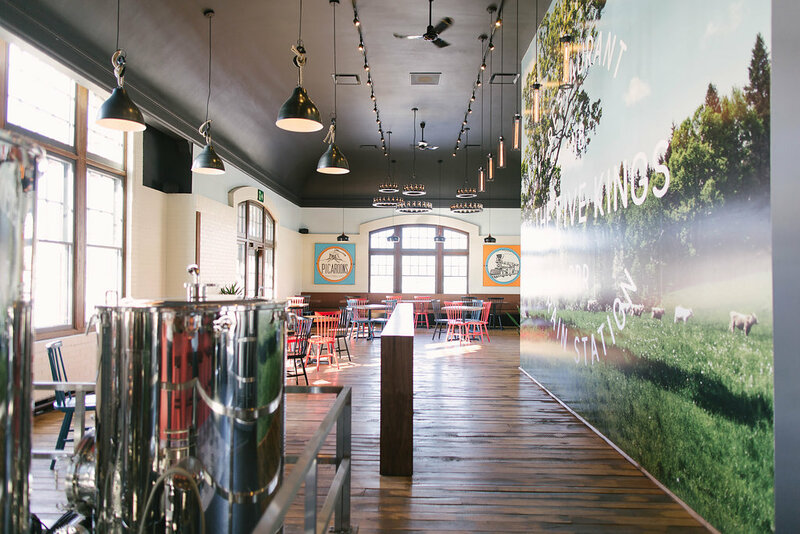 High ceilings and heaps of natural light pour through the space which made creating a warm and invited brewtique and restaurant so much easier. Different types of flooring indicated many past iterations of this train station. The front desk was still intact in front of a large window. One of the main characteristics of the building was its nearly perfect symmetry. The brick was in great condition but because its colour was somewhat drab we knew it would need to be refinished or painted. Honouring the building’s history and strong architectural elements was key to this project. We wanted to highlight these features and complement them rather than have the design compete with them. 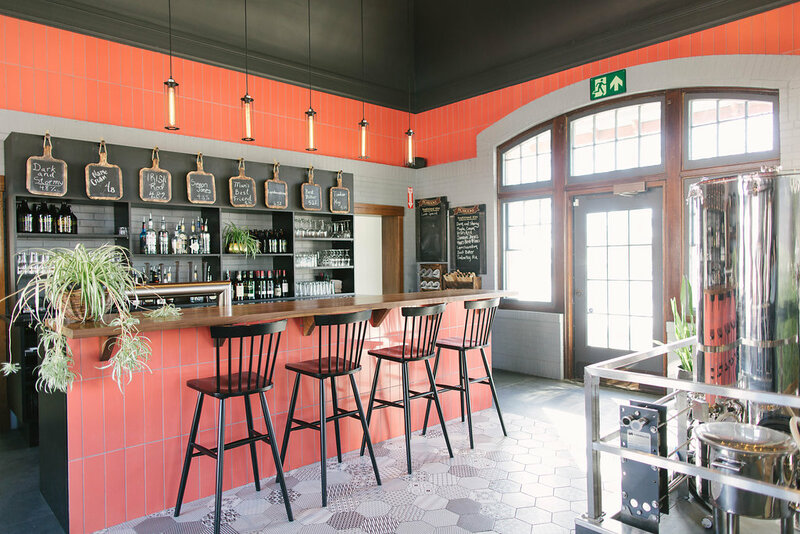 Using design elements to accentuate the high ceilings, soft low lighting, and incorporating raw organic materials enhances the building’s character and history while also giving The Five Kings Restaurant and Picaroons Brewhouse their own voice and identity. The new branding is exhibited on wooden exterior signage outside the building! Zuomod Tauranga Pendants are hung above the bar to add warmth and industrial style. Railroad spikes are used as levers for the beer taps and hooks to hang signage as an homage to the history of the building. A photograph mounted in the centre of space introduces an organic element to a restaurant design that balances the industrial materials and design elements throughout. The photograph also embraces the scenic rural areas in New Brunswick. It’s a nod to the fresh, organic ingredients Lisa uses in her culinary dishes. In the restaurant, the brick is updated with Benjamin Moore Monterey White HC-27, and accented by Azure Bloc 4″ x 16″ tiles from Céragrès. EQ3 Lyla Side Chairs in the restaurant in blue echo the red and black seating at the bar while also incorporating colours from the branding. Hand-scraped flooring alludes to the town’s wood milling history. All tables built by Artizan Group. Pieces of reclaimed wine barrels finish a dividing pony wall in the centre of the restaurant. The wine has stained each piece a unique colour which makes the perfect texture for this wall. Industrial style light fixtures were installed for low intimate lighting with the rope, a nod to St. Stephen’s Croix River (Tuck Studio). The chandeliers (available through Tuck Studio) were chosen to accentuate the high arched ceilings while casting a candle-like glow on the tables below. When sitting under these lights remember to look up at the beautiful wood accents. Liam Pendants (Tuck Studio) were chosen as soft mood lighting to be hung over the banquette area. New custom wooden tables were stained to coordinate with the window trim that is original to the building. Inspired by the branding by Lise Hansen, Lisa and Sean commissioned Geoff Slater to produce the restaurant and brewhouse artwork. All photos by Kelly Lawson. See the entire project in the gallery below! As with most of our posts, we encourage sharing if you feel inclined! We are collaborating with The Five Kings & Picaroons Brewhouse to do a share-to-win contest! Either share this post through Facebook, Twitter or Instagram and your name will go into the draw to win a a beer tasting for 8 people! The draw will take place on May 12th at noon.